Karen Benson is a Professor of Finance at UQ Business School, and Deputy President of the Academic Board, The University of Queensland. 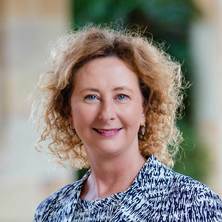 She has held a number of leadership roles in the UQ Business School including Director of Accreditation 2015-2017, Acting Deputy Head of School 2016-2017 and Head of Finance Discipline 2010-2015. Karen's teaching focus is in Financial Management and International Finance with a particular interest in blended learning. She recently led the development of a series of core concept videos for commerce students. Karen's research focuses on Funds Management with particular reference to factors that drive performance and fund flows. Other topics of interest include socially responsible investment funds, social impact bonds and the use of derivatives by corporations and fund managers. Her research has been well received by both practitioners and academics. Karen's work is published in internationally refereed journals including Journal of Banking and Finance, Pacific Basin Finance Journal, and Journal of Business Ethics. She is the Deputy Editor of Australian Journal of Management and President of Asian Finance Association. Mutual Fund families and financial crisis - A performance study towards family risk exposure. How do 'busy' and 'overlap' directors relate to CEO pay structure and incentives? Corporate social responsibility and CEO compensation revisited, do disaggregation, market stress, sender matter? Do derivatives have a role in the risk shifting behaviour of fund managers? Benson, K. L., Faff, R. W. and Nowland, J. (2007) Do derivatives have a role in the risk shifting behaviour of fund managers?. Australian Journal of Management, 32 2: 271-292. Do socially responsible fund managers really invest differently? Benson, K. L. and Humphrey, J. E. (2005) Comparing SRI funds and conventional funds. Portfolio Construction Journal, 2 1: 30-33. Does the short rate predict market returns? Benson, K. L. and Gray, P. K. (2005) Does the short rate predict market returns?. Journal of Investment Strategy, 1 1: 59-62. Benson, K. L., Pope, P. and Faff, R. W. (2003) An investigation of the relationship between stated fund management policy and market timing ability. Pacific Accounting Review, 15 1: 1-16. Benson, K. L., Pope, P. and Faff, R. W. (2003) The relevance of investor risk classes in ranking fund performance: An application of the Extended Mean-Gini CAPM. Journal of Quantitative Economics, 1 1: 20-35. Benson, K. L. and Faff, R. W. (2003). Conditional performance evaluation and the relevance of money flows for Australian international equity funds. In: AFAANZ 2003 Annual Conference: Program and Abstracts. AFAANZ 2003 Annual Conference, Brisbane, (38-38). 6-8 July, 2003. Benson, Karen L. and Faff, Robert W. (2002). The relationship between exchange rate exposure, currency risk management and performance of international equity funds. In: Accounting Association of Australia and New Zealand (AAANZ) 2002 Annual Conference: Program and Abstracts. AAANZ 2002 Annual Conference, Perth, Western Australia, (30-30). 7-9 July, 2002. Benson, K. L. (2002). The relationship between exchange rate exposure, currency risk management and performance of international equity funds. In: A. Pinnington, 4th Annual RHD Student Colloquium - Abstracts. 2002 Research Student Colloquium, Riverglenn Conference Centre, Indooroopilly, (8-8). 1 June, 2002.